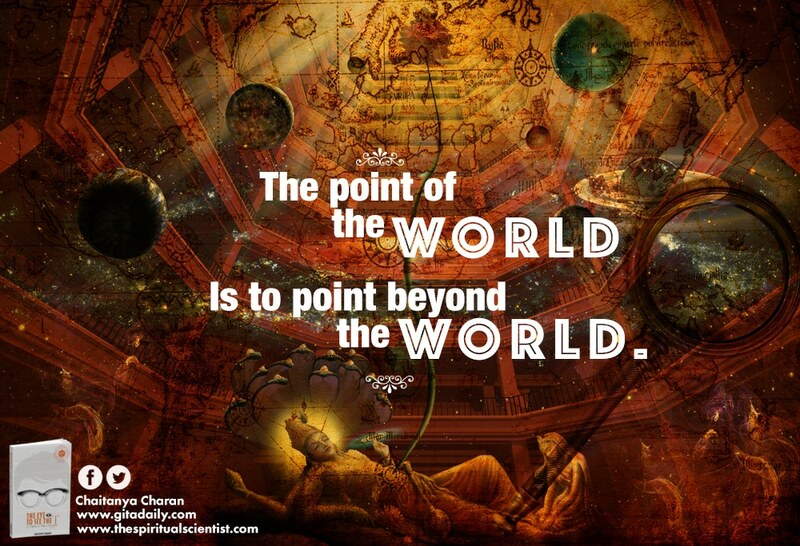 It isn’t pointless, Gita wisdom assures us. The point of the world is to point beyond the world – a point that we miss if we look at only the world’s misery or only at its beauty. Looking only at the misery makes us gloomy and cynical, even giving up the struggle to live. Looking only at the beauty infatuates us with hopes of becoming happy here – hopes that are invariably dashed by the world’s temporality. Looking at both inspires us to look beyond the world. From the world’s misery, we can infer that it can never provide us real happiness. From the world’s beauty, we can infer the existence of a beautiful world-maker. Scripture complements our inference by revealing an all-attractive all-loving person, Krishna. The Bhagavad-gita (10.41) states that all beautiful things manifest a spark of his splendor. By using our God-given intelligence, we can make the world’s beauty stimulate our remembrance of the beauty of their source. Bhakti-yoga trains us in this redirection and revives our love for Krishna. He is eternal, as are we, being eternal souls. So, our love for him, unlike worldly love, can continue eternally, bringing us the supreme fulfillment. The more we practice bhakti-yoga and use worldly things in Krishna’s service, the more we relish glimpses of that fulfillment even here. Then we gradually realize the purpose of this world – not as a provider of material pleasure or pain, but as a pointer to the supreme lover and pleasure-giver beyond this world. Just amazing explanation of the verse. THANK YOU very much. This is a very beautiful article. We should not focus on material duality and Krishna as the source of it, but we should focus on eternal, unconditional love of the spiritual world and Krishna as the source of it. Very enlightening article. Gita teaches us to rise above the three modes of material nature, namely goodness, passion and ignorance and to the level of Krishna consciousness and by bhaktiyoga experience His infinite potencies. The beauty that is in this world is insanely beautiful. How much more so is the One who is the source of it?